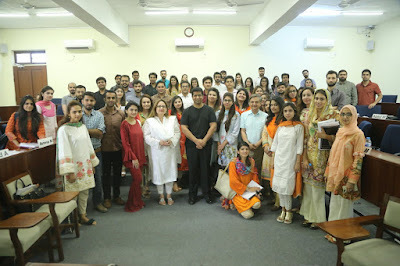 Mr. Monis Rehman, CEO of Rozee.pk, Pakistan’s largest internet-based employment advertising company, paid a visit to the Lahore School on April 5, 2018 and delivered a sterling session to the MBAs on “The Human Challenge while taking a Small Company to the Next Level”. Monis noted at the outset that as organizations grow, as matter of fact they become less nimble and agile. The CEO wraps around him larger offices, secretaries, lounges, couches and so on. The Vice Presidents expect what they think their status deserves. However, this could damage organizations. But how to stay nimble and agile? Rozee was started in a room with four people, including Monis. Communication and feedback were easy as all sat in the same room. But as it grew to 20 employees, it was a big jump as now he had to understand 20 different persons with their own personalities, socio-economic backgrounds and other factors. Humans are different from machines: Everyday they can be in a different mood or frame of mind. Then Rozee moved to 80 employees. When a company is growing fast you need people. You hire them. Some are not a culture fit, others are not skill fit, but you do not know that – not yet. All organizations make mistakes at that stage but how do you correct them? The difference between successful and not successful organizations is that in the first category there is a quick iteration and self-correction. Of course you develop feedback systems. How do I grow sales? I need to measure what is happening. I need to create KPIs, measure and communicate my goals as CEO to the teams and their leaders. If three of my sales team leave, I need to know what happened: Was it a processual problem or a managerial problem or a task problem or what? At the same time the system has to reward those who are doing well. The system has to pick leaders who can take responsibility (and do not panic at the thought of being responsible for others). Now you have 80 employees and you have systems of measurement, feedback and control (dashboards). Now you need to replicate the success in different offices and centers across Pakistan but in a way that you do it without losing your culture. Your people will tell you – the market is bad. But it could be that you did not train them. Or that they are not disciplined enough. Or maybe the structure of your compensation is not effective. At Rozee we sit in an open space. I remember when I was working at my desk and an employee came to my desk (in the open space) and asked “May I enter?” Rozee is about transparency: within the organization so that nobody hijacks the agenda, between offices, between teams and so on. We communicate. Monis also gave the MBAs tips on how to do well in interviews. Monis’s session, as always was extremely well received. The MBAs were glad to see a Pakistani role model business leader as a speaker.